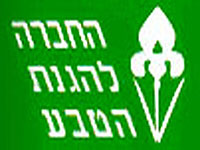 in Hebrew: shoshan, שושן, "פלור דה ליס". 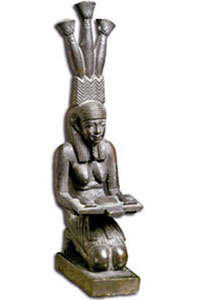 The Ancient Egyptian hieroglyph for "Tree of Life" ("I am the plant which comes from Nu/Osiris") was three lotus lilies. The trunk of the tree represented the World Pillar, the center of the universe. The "Fleur-de-lis" traces its origin back to this hieroglyph for "plant" meaning "Tree of Life": three stems curving to the left and on top of each stem is the Lotus flower which was used in Ancient Egypt to represent Life and Resurrection. Some say the "Fleur-de-lis" derives from the iris, a stylized Iris pseudacorus L., others say it is the lily, Lilium Candidum of the family Liliaceae, or the broom, the lotus or the furze, or whether it represents a trident, an arrowhead, a double axe, or a dove or a pigeon. The lily has six petals shaped in the form of a six-pointed star. In Hebrew it is called shoshan, derived from the number six, shesh. 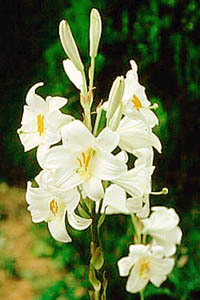 The Israelites regarded the lily as the choicest among flowers and used it as a source of perfume. In ancient Hebrew poetry, the lily was always a favorite simile as a symbol of purity. King Solomon (10th century BCE) referred to the lily of the valleys, shoshanat haa'maqim, in his Song of Songs 2:1. Lilies were commonly used as architectural motifs in ancient Israel, including the First Temple: "The capitals at the tops of the pillars in the [Temple] vestibule were shaped like lilies and were four cubits high," declares 1 Kings 7:19. The prophet Hosea (8th century BCE) described the lily as the flower symbol of Israel: "I will be like the dew to Israel; He will blossom like the lily, and he will take root like the cedars of Lebanon...." (Hosea 14:5). From the Second Temple period (6th-1st century BCE), the lily became a popular motif in Jewish art. Both, the fleur-de-lis motif and the six-petaled star motif of the lily flower became classical. The fleur-de-lis became a widely used symbol. It is found in East Indian, Egyptian and Etruscan decorations, as well as Roman and Gothic architecture. It is frequently used in Mamluk crenellations. The fleur-de-lis did not originate in France. A traditional story tells the Frankish King Clovis I choose the fleur-de-lis as a baptismal symbol of purity on his conversion to the Christian religion in 493. Some legends claim that the lily itself appeared at the baptismal ceremony as a gift of blessing from an apparition of the Blessed Virgin Mary, who is often associated with the lily. Through this connection to Clovis, the fleur-de-lis symbolized the Merovingian dynasty and then became a symbol of the entire Christian Frankish Kingdoms. Empress Theodora (A.D. 527) bore an emblem of the Fleur-de-lis on her crown. The Crusaders introduced lilies into European Christian art; because of its association with the Crusaders, the lily came to stand for chivalry, and the French nobility adopted the fleur-de-lis as its symbol. The motif was first used by King Philip I (1052-1108) of France in the 11th century. The 'Lilies' are said not to have appeared in the French arms until the time of Philip Augustus (1165-1223). In Christian symbolism, the fleur-de-lis is used as a symbol of the Holy Trinity and as an ensign of the Virgin Mary. By the 13th and 14th centuries, the three petals of the fleur-de-lis were being described by writers as symbols of faith, wisdom and chivalry. Fleurs-de-lis are now most commonly associated with France. In ancient times they may have signified a connection with that country through war, marriage or property rights. In English arms it was sometimes used as a mark of cadency for the sixth son. The Prince of Wales's triple plume appears to have the same mythic Egyptian and Babylonian origin, and to be substantially the same symbol as the 'Fleur-de-lis'. When arranged in threes, the 'Fleur-de-lis' represent the triple powers of nature--the 'producer', the 'means of production', and 'that produced': The 'Fleur-de-lis' is presented in a deep disguise in the 'Three Feathers', which is the crest of the Prince of Wales. Its use in royal heraldry goes back to Edward Prince of Wales (the Black Prince) in the 14th century. 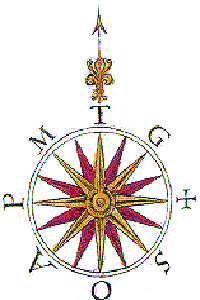 The symbol is also often used on a compass rose to mark the north direction. 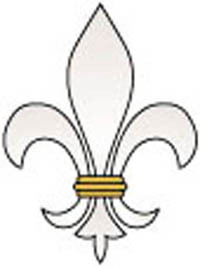 In modern Israel the "Fleur-de-lis" is used as a scout (Tzofim) symbol, used as the insignia for the IDF Military Intelligence (Aman) and the society for protection the Nature of Israel, SPNI. 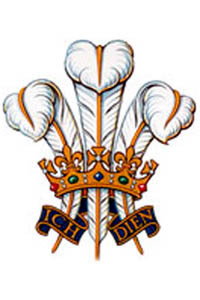 The badge of The Prince of Wales comprises three silver (or white) feathers rising through a gold coronet of alternate crosses and fleur-de-lys. The motto "Ich Dien" (I serve) is on a dark blue ribbon beneath the coronet. Its use in royal heraldry goes back to the time of Edward Prince of Wales (the Black Prince) in the 14th century.